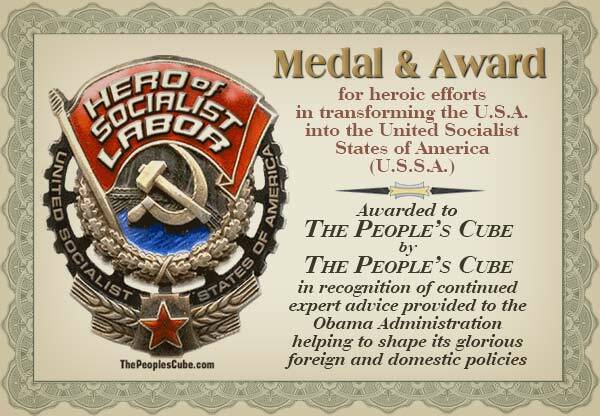 The People's Cube gives itself "Hero of Socialist Labor" medal in recognition of continued expert advice provided to the Obama Administration helping to shape its glorious foreign and domestic policies. In all humility we accept the award we gave ourselves. Congratulations, it's about time we recognize our own importance and influence in the fundamental changing of America. And we so richly deserve this!!!! I say an extra ration of beet vodka all round is called for! Thank you, than you very much! You obviously have too much time on your hands and we have ways to remedy that! 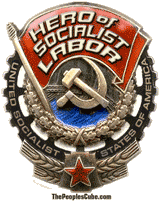 As I already have the Order of Hillary and the Order of Obama/Hero of Change, I will proudly display our most deserved Hero of Socialist Labor award!!! Hey! Can we get George $oro$ to present it to us? When Pinkie finds out that Comrade Fhalkyn has been in the "beet of the week" locker unsupervised, there's going to be hell to pay. Medical help is now on standby. Enemy of the people and future unperson Sheriff Joe Arpaio has proven that this award is clearly a photoshopped forgery. May I nominate Ushanka.us for the next award? We have provided years of expert advice to our Dear Leader and his Czars on the proper wear and care of the new national hat - the Commie Obama ushanka hat. It is also green - you can turn your smart meter lower as the hat, combined with Vodka, keeps you warm in the winter! Is there a comrade who will 2nd our nomination? Heartiest congratulations to the Cube. Awarding medals to one's selfs is an age-old tradition. Just recently, we have cases as LBJ awarding himself in metal for imaginary action; John Kerry awarding himself medals for imaginary combat and razor cuts. The key ingredient here appears to be creativity, something from nothing! Last edited by General Confusion on 3/22/2012, 12:20 pm, edited 1 time in total. Long live the glorious Peoples Cube! It is time to award ourselves and our glorious kollektive of kontributors for the second time! In addition, this medal has now been added to the Clipart section in our "Editor for the Rich" to facilitate further award ceremonies. The reason that it hadn't been added before (2012) was that we had exceeded our quota of awards for that Five-Year Plan. In this Five-Year Plan, however, the all-caring Party has wisely decided to raise our award quota.